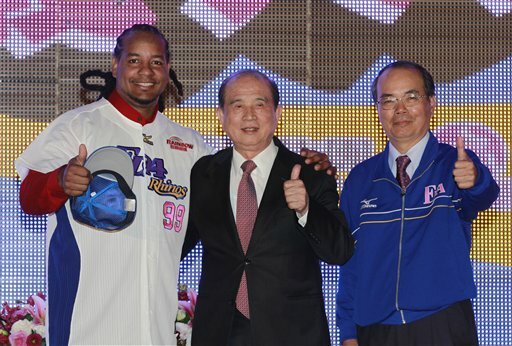 Believe it or not, Manny Ramirez is now plying his trade for the EDA Rhinos, a Taiwanese team in the Chinese professional baseball league. Yeah, this is going to end well. Manny being Manny, in Taiwan. This is not a dream. This is reality. Manny Ramirez, yes, that Manny Ramirez, is now playing professional baseball in the Chinese baseball league. He is playing for the EDA Rhinos, one of the four Taiwanese teams that ply their trade in the Chinese Professional Baseball League. Ramirez is earning the equivalent of approximately $25,000 a month to play, although you can bet there are other benefits. For example, we doubt he is paying for his accommodation and there appears to be some sort of ‘daily stipend’ involved, which is probably bigger than you or my monthly salary anyway. Put it this way, we highly doubt Manny Ramirez is playing baseball in Taiwan and China for $25,000 a month alone. Manny has his debut under his belt now, making it all official. In this historic encounter (anything involving the words ‘Manny Ramirez’ and ‘Chinese baseball league’ in the same sentence can be called historic) the Rhinos lost to the ‘Brother Elephants’ (once again, this is not a dream, this is all reality) 8-9. Ramirez went 2 for 6 with two singles. The capacity crowd of 20,000 Rhinos fans greeted his every move with a fondness and admiration normally kept for puppies doing something cute. Manny’s first hit in Chinese professional baseball came in the second inning. We have it for you right here, and yes, you are welcome. What does Manny make of all this? There are unconfirmed reports that the dreadlocked slugger and former World Series winner thought his agent said 'Toledo' (not Taiwan) and agreed to the deal on that basis. Whilst this report is not confirmed, this is the same player who once sent a car out for valet service with over $250,000 in uncashed pay checks in the glove compartment.